At the end of last week, we focused on final preparations for an action camp and series of protests to stop ratification of the Trans-Pacific Partnership (TPP) in the lame duck session. We were cautiously optimistic that sustained resistance through the fall would be successful. The TPP was signed on February 4 and President Obama did not seek ratification all year because members of Congress did not want their vote to be on record before the election. Strong actions throughout the year to pressure members of Congress to oppose the TPP had an impact. Even Rob Portman (R-OH), a former US Trade Representative under President Bush, switched his position and opposed the deal. During the presidential campaign, all of the candidates came out against the deal, except Gary Johnson. Sanders made the TPP an issue with Clinton; and Trump continued that through the General Election, especially in Rust Belt states. For the past two months Sen. McConnell and Speaker Ryan kept telling Obama – we don’t have the votes and will not consider the TPP in the lame duck. The White House and other TPP proponents lobbied Congress in hopes that the situation would change after the election. The night before our long-planned action camp began, the White House announced they would not be submitting the TPP for ratification. After more than five years we had a major people-powered victory over transnational corporate power! The media gave Trump the credit but the reality was no matter who was elected, the movement to stop the TPP had the votes to prevent ratification. We quickly changed course to focus on how the movement could build on this incredible people powered victory. Could we create momentum for trade that puts people and planet first? Were the times focused on trade or did the recent election dominate? How could people power play a role in responding to the election? What should the movement be doing in the era of Trump? The camp turned out to be a great opportunity. We had a solid core of activists together and for the first two days a lot of time was spent thinking together about the role of the movement in the era of ‘Trumpism’. Trumpism refers to the racism, xenophobia and misogyny of Trump’s campaign and our suspicion that he is a fake populist who will pursue an extreme right-wing agenda, as evidenced by his selection of Mike Pence as a running mate and other appointments. We all recognize the risks of a Trump presidency, but we also saw opportunities. First, we realized that the tremendous victory we just had to stop the TPP was proof that people have power when they work together and mobilize. 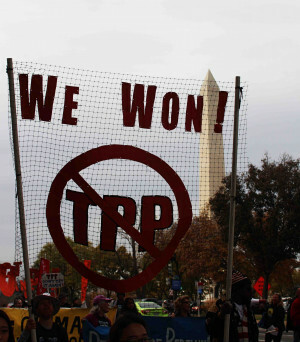 When we started the campaign to stop the TPP, the challenge of taking on transnational corporations seemed formidable. In the end, a movement of movements transformed the debate around rigged corporate trade and made it politically toxic. Second, we recognized that the culture of resistance is strong and growing in the United States. Some movements, such as Black Lives Matter, fossil fuel infrastructure blockades and fights for immigrants rights, living wages and food justice, are particularly strong. 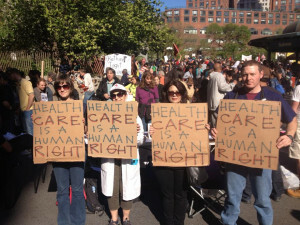 Some movements that declined under Obama, like improved Medicare-for-All and the peace movement, are coming back to life. Third, the election results are the reflection of a voter’s revolt against the political elites. Activist Nicole Carty explains in Our Movements Are Powerful, the Institutional Left Isn’t the Solution. Here’s What We Should Do Now, the blame falls on the shoulder of the Democratic Party and the Institutional left, aka the nonprofit industrial complex. It was the failed neo-liberal and imperialistic policies of the Democrats and the non-profits who supported them no matter what that fueled the revolt. In the Trump era (as would also have been true if Hillary Clinton had been elected), our movements will continue to grow and gain power. Neither the Democratic nor Republican Party, nor Trumpism, will respond to the people’s urgent necessities. 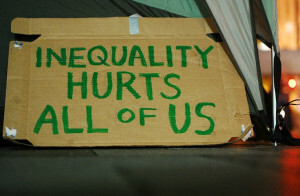 The wealth divide will not shrink under rule by wealthy elites and the economic insecurity felt by the vast majority of people in the United States will not abate. The oligarchs will not address the climate crisis or racial injustice in law enforcement and the corruption of government by big business will continue. On these and the other fronts of struggle, the establishment will ignore us or inadequately respond, and the result will be a growing popular movement. Longtime labor and anti-war activist, Michael Eisenscher, who lived through the McCarthy era as a child, the Nixon presidency and more, tells us that it seemed impossible coming out of the Cold War, the conservative 50s and the McCarthy era that an era of mass movement would bloom in the 60s and 70s – continuing after Nixon’s election – that favored Civil Rights, environmental protection, women’s rights and an end to war. Despite Trump, the future remains ours to define. It begins with a clear vision of the future we want to see that inspires and mobilizes people to make it reality. We go into the Trump era with a president who failed to win the popular vote, winning less than a majority of voters in the lowest turnout election in 20 years. The nation has 219 million eligible voters but only 126 million voted. A mere 27% voted for Trump and the votes for Trump were mostly against Clinton and the Establishment. Trump has no mandate for radical conservative change. If he pursues an extreme right wing, pro-corporate agenda tinged with bigotry – as seems to be his path from his initial appointments – the backlash will be great. Eisenscher looks at the vote totals and concludes that people feeling economically insecure voted for Trump. Many of these are the same people that voted for Barack Obama, so despite Trump’s playing on racism and bigotry to energize a portion of his base, those were not the issues that won the election. However, it is revealing that they were not deal breakers for voters. There are essential steps we must take in order to turn popular discontent of the status quo into a political force. This is essentially what we described as the responsibility of the movement several years ago – our job is to build national consensus for the changes we need to see. Present a Vision: In the confusion and political space created by Trump’s win, the people must present a clear vision of the world we want to create. There is a new populism that demands a people’s agenda, which defines how we would confront the multiple crisis issues the country faces. We can look to experiences around the world to show people there are possibilities that already exist. Senator Sanders elevated the democratic socialism of Scandinavian countries and how they have brought economic security to their people. There have been major advancements in Latin American countries from which we can learn. And, there are examples within the United States of systems that work, e.g. traditional Medicare provides health services with low overhead and high approval (there is an opportunity to advance single payer in the Trump era), the public bank of North Dakota shows a way for communities to break from Wall Street and create their own finance system, and Burlington just became the first fossil fuel free city. The issue of trade must be rethought so it puts the necessities of people and planet before the profits of wealthy transnational corporations. 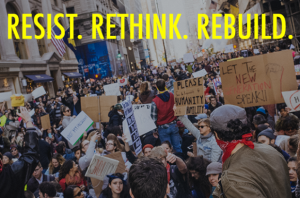 Create Solidarity Across the Movement: Big successes have come from campaigns where people focused on different issues worked together for a common vision. The TPP campaign was the largest campaign ever against corporate trade cutting across labor, environment, Internet, food, healthcare and other issues. Net neutrality (which we will have to defend) brought together multitudes of advocates because the Internet affects everything. With attacks coming on immigrants, Muslims, blacks, women and others the movement will have to be in solidarity protecting each other. Stop the Worst of Trumpism: Climate activist Terry Tempest Williams says “Resistance is our courage.” Indeed, we need to stop the worst policies of Trumpism but also must urge solutions that are needed. This stop the machine-create a new world approach must continue in the Trump era. This would have been true if Clinton had become president as her allegiance to Wall Street would have created policies for the 1% that needed to be stopped as well as stopping her likely increase of militarism. With Trump, the issue of militarism reverses and we may be fighting the neocons and humanitarian war advocates if Trump does as promised and reaches agreement with Russia to end the Syrian war. Movements need to be independent of the oligarchic parties and push their own agenda. Build Our Power: The movement needs to continue to build its power so people see that participating will create the world we envision. We need to show how if we reach national consensus on an issue that getting active can create change. We can hold politicians accountable. This also requires continuing to build an alternative to the two big business parties as neither has represented our interests. We need an alternative party or parties that can impact the outcome of elections. Our action camp decided to celebrate our current win against the TPP and the other agreements, TTIP and TiSA, and recognize that we can build on that victory to demand a new era in which people set the political agenda, not the elites. On the first day of the lame duck session of Congress, we had a lively and colorful march through DC with giant banners that proclaimed our victory and others that said “Rise Up”, “Reject Fake Democracy” and “Protect People and Planet”. 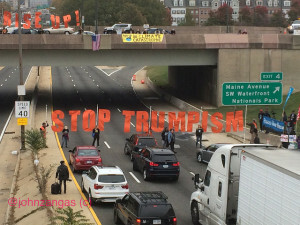 At the end of the march, another group blockaded the highway used by members of Congress to get to the Capitol with a forty-foot wide banner that said “Stop Trumpism”. After the blockade, we stood on an overpass over the highway with all of the banners. The show of support by drivers was immense. 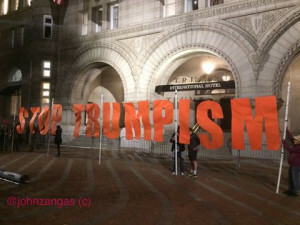 This was followed that evening with a march to the Trump Hotel that began on Capitol Hill. People carried torches and pitchforks symbolizing our growing anger and held the Rise Up banner. At the hotel we held the massive Stop Trumpism banner, chanted, spoke out and wrote our vision of what we want in chalk on the sidewalk. The next day we showed our solidarity by bringing our art work and bodies to a national day of action #NoDAPL protest of about a thousand people. 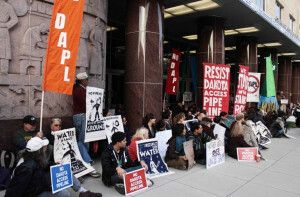 The battle against the Dakota Access Pipeline has become a center of opposition to the massive number of pipelines and carbon infrastructure built by the Obama administration despite science telling us we must stop building carbon infrastructure. The protest started at the Army Corps of Engineers and marched to the White House. The fight against carbon infrastructure will be especially difficult under Trump as he and his advisers are invested in and profiting from oil and gas. We also showed solidarity with more than a thousand high school students who walked out of their schools to protest the bigotry that Trump showed during the presidential campaign. This protest has been part of a series of protests throughout the country that has exploded every day after the election. The Republicans are claiming these protests are created by the Democratic Party and big donors like George Soros, but we see it as blowback to the Trump campaign’s rhetoric. The next morning we decided to highlight the complicity of the Democratic Party by going the headquarters of the Democratic National Committee with a moving truck to move them out of their offices. We brought boxes labeled with “lies”, “excuses”, “DNC emails” and more. 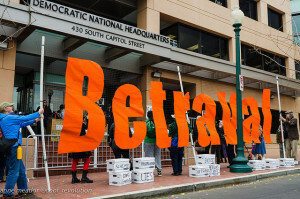 We held a large banner in front that said “Betrayal” to alert the Democrats that they have betrayed their base. Trumpism would not have found roots if the Democrat Party policies favoring Wall Street and big business had not left most voters financially insecure. We cannot over-emphasize the need for the movement to be independent of both oligarchic parties from which there is mass alienation, including the Democrats. The Democratic leadership remains tied to big business. The new Democratic leaders in the Senate are Chuck Schumer (NY), essentially Wall Street’s senator, and Patty Murray (WA), an ardent supporter of corporate trade who represents Boeing, Microsoft and Google. Sen. Sanders has been given a role in leadership in a new post, Chair of Outreach, which hearkens back to what people described as his sheep dog role in the election. The Democrats seem unwilling to face the reasons for their failures and are spending more time looking for scapegoats, as they did in 2000 with the blame Nader propaganda. Will the Democrats break from the disaster of Clintonism and put forward a populist economic agenda or make the mistake of focusing their attack on Trump personally? If the latter, Trump may be a two-term president. 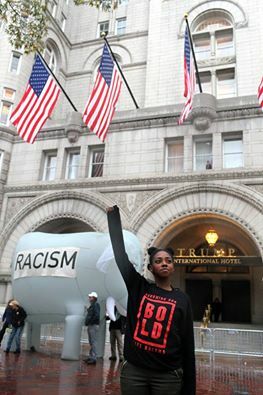 Our final protest went back to the Trump hotel where we set up a table and chairs to create a living room and had a fifteen foot tall inflatable elephant with the word “racism” on the sides, the proverbial elephant in the room, to start conversations about whether Trumpism is the ideology people in the US support. We saw the week as the start of a new campaign to fight for a people’s agenda and to end oligarchy. We know neither major party will put forward the agenda we need, it is our responsibility to do so. With the election of Donald Trump as president the struggle continues for economic, racial and environmental justice. We knew we would be in struggle no matter who was elected and have been calling for #NoHoneymoon protests for months. We also support calls made for protests in the days before the inauguration and after them. 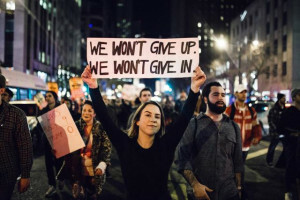 We expect to see a growing presidency of protest under Trump as the movement will grow and continue to demand justice, human rights and a people-based democracy. At the same time, we will put forward an agenda that is based on our vision and our values. We know the 2016 election was a protest vote against a political system that has lost its legitimacy in the eyes of most people in the US. It was a desperate act of protest that will neither solve the problems the people face nor create economic security. We need to build now, provide a vision and have conversations at the local level so when the attacks on our communities occur and false promises of Donald Trump are made obvious people know where they can turn. We can turn widespread discontent into a mass movement with the power to transform the nation. Thanks for your clear analysis. I would like to add a few points on strategy. President elect Trump has opposed TTP. Give him credit for seeing the issue clearly, and weighing in on the side of people and jobs. Lets drop the divisive, straw man tone of the media/selection. Lets work together with other sane and reverent people of goodwill. Polarisation means nothing goes forward. Why not work with this administration as we can? The devil is always in the details with legislation, especially when helicopter money is in the offing. So, lets make solid proposals for jobs and retrofitting our buildings, solar, etc. Bring in the experts on each policy area, and write the legislation. Make good results, in which Trump looks good, can claim success, and as a movement, we get what we need, or at least a few seats at the table. Lets give Trump a chance to do some really great stuff, not just build hotels. Lets educate him on what works financially speaking, like single payer. Let him take the credit. And lets attack racism where it really has the power to harm; in our institutions, not in the cartoon of a public personality. Replying to ” Polarisation means nothing goes forward.” (from above). Actually,m if you understand the dialectical process, polarization is EXACTLY what moves things forward. When there is a condition of irreconcilable forces after a long period of incremental change, an abrupt rupture with what WA is necessary to bring into being that which BECOMES. So it is with earthquakes, with birth, with volcanoes, and political revolution. The shell of a chick which protected it finally must be broken for the chick to live. Well, yes. But perhaps we have done with that phase? Isn´t it time to build new institutions to replace those currently dysfunctional? Might´t we develop the political maturity to stop demonising the other? Yes, of course we need to replace dysfunctional institutions–my very point. They cannot be “reformed.” A rupture in the political establishment is taking place out of necessity. Scary, but so is continuing on the same path we have been on, right? Of course too, demonizing doesn’t help; but clear analysis such as Popular Resistance provides is just what we need. Kudos for that! Those in power must be removed from it so we can live and invent a truly civilized society. The problem in the US: We’ve been in similar messes before, but this time, years of work first went into splitting apart the proverbial masses, pitting us against each other by class and race.The past eight years only more deeply divided those who are not on the right wing, middle class vs. the poor, black vs. white.Divide and conquer. We’re now in new territory, and have no idea of what to expect. People have been calling for jobs for over 30 years. Until enough jobs come along, and everyone is able to work, what should we do with all those who have been left out? A basic living income independent of a job. Credit union is the way then…..